A day of travel: from country pueblo-like Phonsavan in a small Laos Air turbo prop to Vietiane - bustling capital - lunch at Setha Palace hotel on my favorite green papaya salad (very spicy) and fresh veggie spring rolls - then to a brief meeting with the US Ambassador - and back to the domestic airport for the 35 minute flight to Luang Prabang. The air in Luang Prabang is red and smokey as rice fields are being burned off in preparation for planting. (cough, cough). But, here lies a charming place of discovery - a cross between Havana, Hawaii, and New Orleans. And guess what, for the next three days the Laotians celebrate their New Year. How? water fights. Everywhere. Oddly it seems in this town foreigners are the major perpetrators. At this time, little kids and big ones carry major water guns. We are well warned to dress in dark colors and put cameras in plastic bags. As we drove through this amazing jungle city there was celebration and markets and enticements everywhere. Then fireworks and beauty contests. 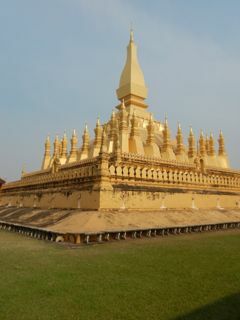 Our new guide said the mood in Luang Prabang is laid back - he called the spirit Laos PDR (Laos People Don’t Rush). 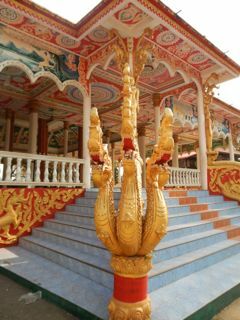 It sits along the Mekong River on the side of a mountain of jungle and small as it is, contains 32 Buddhist temples. When we arrived at the Satri House early evening, I thought I had walked into my dream home. We’ll see. 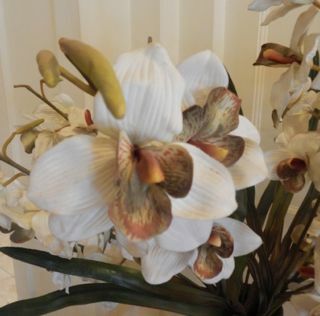 Courtesy abounds as do intriguing incense-like odors. This is a short blog but I wanted to share the conversation with an amazing US Ambassador, Karen Stewart from Miami who seems to love and understand the Laotian people and has encouraged the government to be generous in offering services to this country’s tribal population. She has been in this role in Laos for two and a half years. Of course the Embassy in Vietiane is a huge fortress of white and tall fences on a street basically blocked off by security police. It’s the same structure that was in place during the Vietnam War days. A new one is being built a bit outside the center of town. Passports, cameras, cell phones are confiscated at the entrance gate. The police were Laotian, which was encouraging. Ambassador Stewart is a confident, knowledgeable woman who kindly discussed programs, problems and some tourist questions (like where can one buy organic silk yarn). She said crime was growing among youth - mostly purse snatching and theft but also because of the rising popularity of methamphetamine. She admitted so far there are no statistics. Youth who commit real crime go to adult facilities. And there are drug treatment centers, overcrowded at this point. Children are not left homeless. Parents will turn their children in to a de-tox facility for counseling and treatment. They can always return home. Still, I was told the Human Rights Watch did not give a splendid report on the conditions for children in Laos. The Ambassador said there are growing NGOs (Non Government Organizations) sponsoring centers for youth where they might go to play sports, learn, read and be counseled and there is a hot-line. But unlike in the US, children are not homeless.Here they are never removed from their families and there is very little physical abuse of children. But importantly, there are efforts to provide empowering projects for women such as the Sisterhood organization for Hmong women - remember that tribe sided with the American armed forces during the war. What makes one proud is that the US Government is also supporting these projects and building schools in tribal areas. Ambassador Stewart attends a lot of ribbon cuttings and seems to encourage this kind of activity, which I wish more Ambassadors did across the world. She also explained that there are only three Christian churches in Vietiane: a Roman Catholic one, the Lao Evangelical Church and the Seventh Day Adventists. There is also a non-denominational English speaking group who hold services that cover her Scot Presbyterian needs. Jesus seems to convene like minded faiths to come together to worship with and support each other in many countries, as it did in Uruguay. Are you seeing their beautiful stitchery? Your descriptive blogs continue to amaze us. The Laotian orchids are really pretty and the Stupas are impressive. 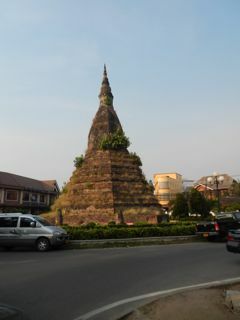 The Stupas remind us of some of the structures we saw in Thailand. You said you walked into your dream home. Your home on Tennessee Street is fabulous. We'll look forward to hearing more about this. By the way, the Grizzlies beat the Houston Rockets last night--first win in 19 visits to Houston. Members of the Governing Board leave Tuesday for the JDAI conference in Atlanta. This is Casey's annual event and representatives from several hundred JDAI sites will participate.